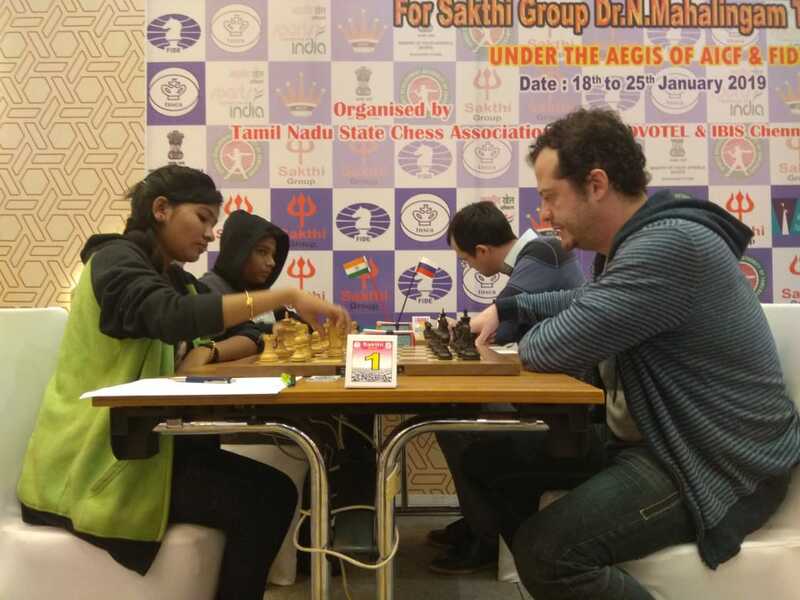 Fresh from his Delhi Open title victory, Georgian GM Pantsulaia Levan (2.0) worked his way through five hours to defeat WFM Saranya in the second round of the 11th Chennai Open International Grandmaster Chess tournament 2019 for Sakthi Group Dr N Mahaligam Trophy at Novotel IBIS OMR Hotel, Chennai here today. Sharing the lead at 2.0 points with Pantsulaia were GMs Rozum Ivan, Popov Ivan (both Russia), Paichadze Luka (Georgia), Aleksandrov Aleksej, Stupak Kirill (both Belarus), Ziatdinov Raset (USA), Tran Tuan Minh (Vietnam), Megaranto Susanto (Indonesia), Czebe Attila (Hungary), Manik Mikulas (Slovakia) Sundararajan Kidambi, Laxman R R (both India) among others. In a hard fought Sicilian game, Chennai girl Saranya J held her own against Grandmaster Pantsulaia Levan (Georgia) till the very end. The knight and pawn ending offered minor chances for the Georgian as he squeezed out a tough win after 108 moves. It was the last game to finish, showing the resilience of Saranya against the second seed Grandmaster. The day saw seeded players going through to the third round sans big upset. In the second board, talented Chennai boy Rajarishi Karthi went down to Grandmaster Rozum Ivan of Russia. With some original play in Queens Gambit Rajarishi rattled the Russian and looked poised for an upset win. But a speculative sacrifice late into the middle-game did him in, as he gave up after 40 moves. A few draws in the main playing hall, where the lower seeded players fought tooth and nail managing to hold higher seeds to a draw. Experienced Kolkata Grandmaster Neelotpal Das drew with fellow Indian Karthik Rajaa, while Rakesh Kumar Nayak snatched half a point from International Master Khusenkhojaev Muhammad of Tajikistan. Local favorites Grandmasters Deepan Chakkravarthy, Sundararajan Kidambi and defending Champion Laxman R R sailed through to comfortable victories. The ten round Swiss tournament carrying a prize fund of Rupees fifteen lakhs concludes on Friday 25th January, 2019.